Gansbaai means Goose Bay in Afrikaans and the name comes from the colony of Egyptian geese that inhabited the area when settlers first arrived. The coastal village is located in the Western Cape, South Africa, and the languages spoken there are Afrikaans, Xhosa and English. It is a beautiful area to visit, especially if you’re a nature lover, as it is home to a wide variety of plants and animals. A great white shark captured on camera. 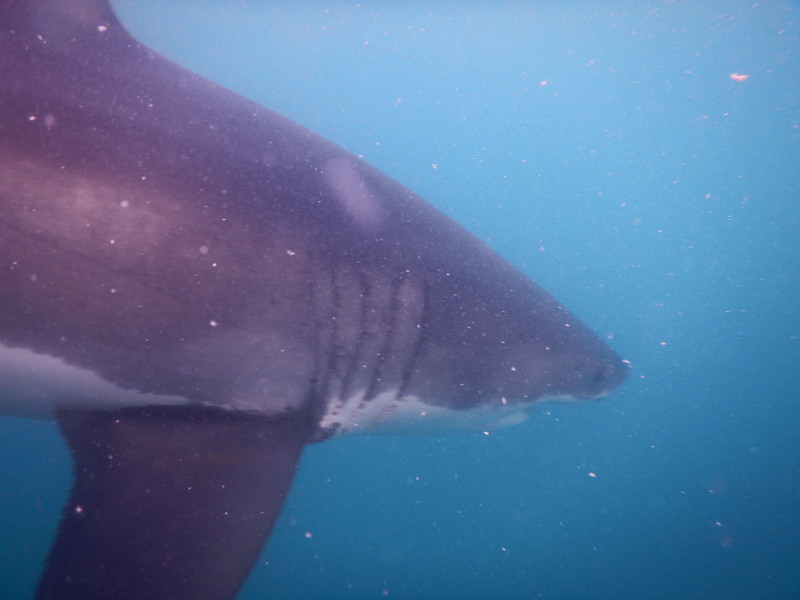 As the great white shark capital of the world, Gansbaai is probably the best place to go shark cage diving, an awesome experience that people of all ages can enjoy. Being in the water with a great white is amazing. I know that some people fear sharks, especially the great white, but I believe that if they tried shark cage diving, they would realise that there is no reason for fear. While we were in the cage, the sharks just swam past without trying to ‘attack’ us, as they are mistakenly shown to do on TV. While I was in the water, not for a single moment did I feel scared or threatened by the sharks. Instead, I felt completely safe and in awe of the huge, beautiful animals. 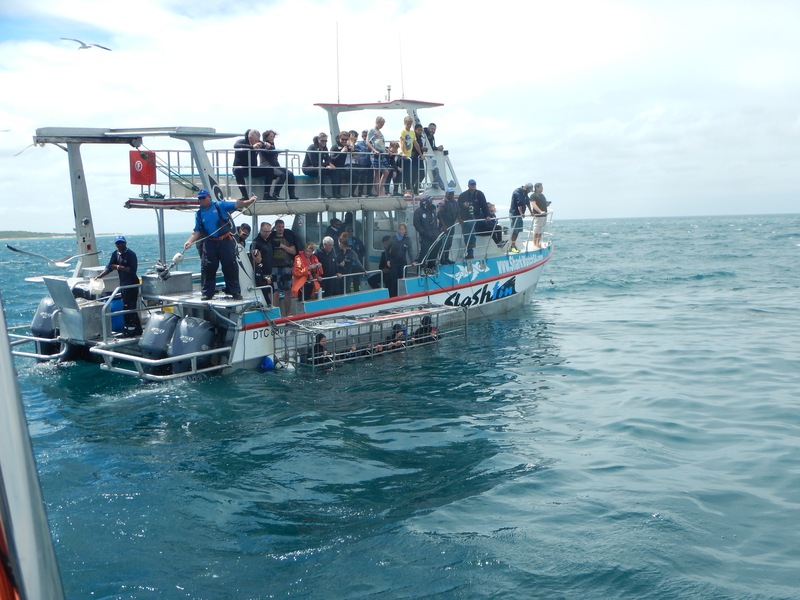 We went shark cage diving with Marine Dynamics, and I would advise others to go with this company too because its boat is designed specifically for shark cage diving and has more area per person than any other such boat. Another great thing about Marine Dynamics is that the money paid for your trip goes to research and conservation projects. 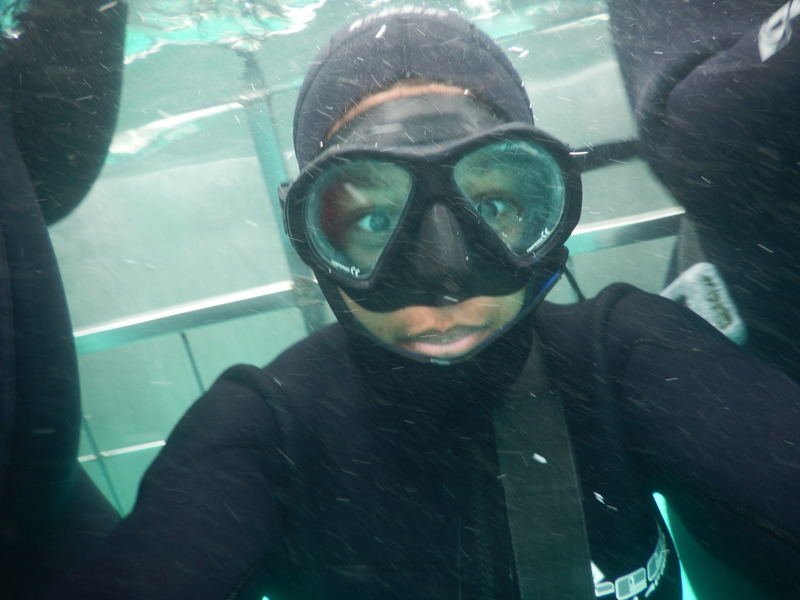 Jaymee (the author) enjoys the cage diving experience with Marine Dynamics. Marine Dynamics’ custom-made cage diving boat Slash Fin. The best time to go whale watching is between August and November, when there is a larger population of southern right whales in the area. Eco-tours are run during the rest of the year, when the whales have gone. Although an eco-tour might not sound as much fun as seeing a whale, I can guarantee that it is very interesting. The trips last for between 11/2 and two hours and you get to observe and learn about the marine Big 5: seals, whales, dolphins, sharks and penguins. There are also other animals to see, such as albatrosses, seagulls and petrels. The boat goes to Dyer Island and Geyser Rock as well as the channel between them, known as Shark Alley. You will definitely see Cape fur seals on the trip as they reside on Geyser Rock. 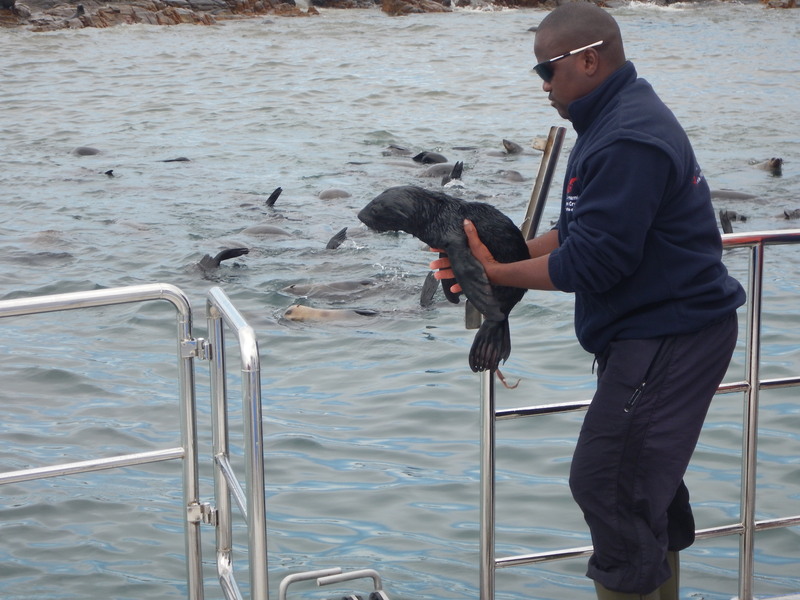 During our trip, the crew picked up an adorable seal pup, which had been born just hours before. We knew this because its umbilical cord was still attached. We had to rub it with a towel as pups have a pelt instead of the thick fur coat that adult seals have to keep them warm. Being weak swimmers, seal pups normally stay on Geyser Rock until they are big and strong. This one seemed to be exhausted and struggled to stay awake. We brought the boat closer to the rock and threw the pup back into the water in the hope that it would swim back to the rock and find its mother. The crew of Dyer Island Cruises returns a new-born seal pup to the ocean. 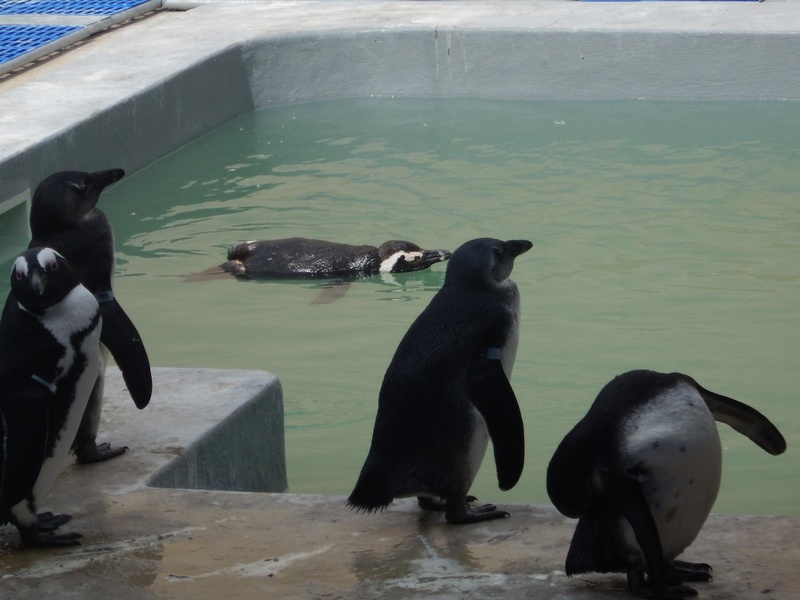 The African Penguin and Seabird Sanctuary (APSS) opened in February 2015 and its aim is to shelter and rehabilitate diseased, displaced, injured and oiled marine birds, especially African penguins. The facility focuses on the conservation of seabirds, but also tries to increase awareness about marine life in general. A large TV in the auditorium shows what is happening behind the scenes. We watched the feeding of penguin chicks, which are fluffy and adorable. The facility is always looking for donations so that it can feed these wonderful creatures. It also has an amazing gift shop with the cutest marine animal soft toys, T-shirts and other products with marine animal themes. We attended an interesting presentation about APSS by a member of the staff and I learnt a lot about seabirds that I hadn’t known before. I really enjoyed my time at the facility and especially enjoyed seeing the penguins. African penguins at the African Penguin and Seabird Sanctuary. 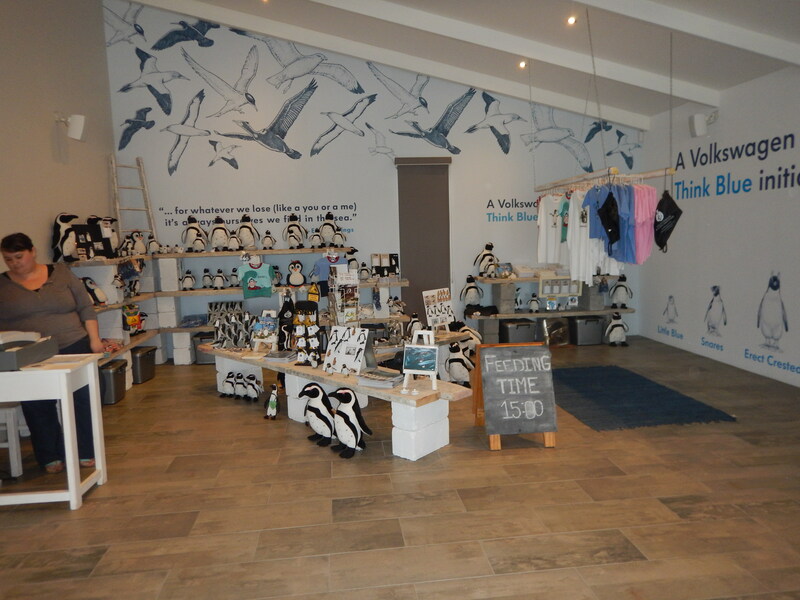 The well-stocked gift shop at the African Penguin and Seabird Sanctuary. The Great White House is a wonderful place to stay while in Gansbaai. In addition to providing accommodation, it has a restaurant and a shop. It is also the command centre for Marine Dynamics great white shark cage diving and the Dyer Island Cruises eco-tours and whale-watching excursions, so it is easy to book your trips and you don’t need to go far for your excursion, as the Great White House is within walking distance of the harbour where you board the boat. A real southern right whale skeleton, named Suzi, hangs from the restaurant’s ceiling. The food there is amazing, especially the desserts, and they also cater to different needs, including halaal. The gift shop is filled with marine-inspired memorabilia, such as jewellery, toys and local arts and crafts, as well as Marine Dynamics-branded clothing, waterproof cameras and books. The Great White House accommodation is simple and comfortable, and the chalets are beautiful and cater for up to four people. The owner and staff at the Great White House clearly care about our environment and a great majority of their products are eco-friendly. One thing I had never thought about before was drinking straws! Birds and other marine animals accidentally swallow discarded straws, which block their throats and sometimes prevent them from eating. The straws at the Great White House are made of paper instead of plastic; this reduces pollution as paper is biodegradable. It also reduces the number of birds at APSS that need help. I loved the Great White House as it is very comfortable. 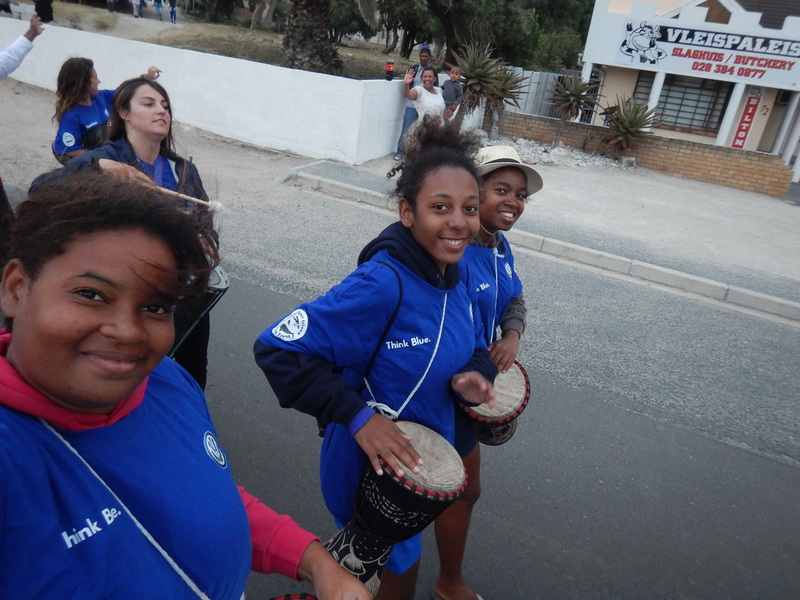 The Seychellois Youth Ocean Ambassadors in the Gansbaai parade. If you visit Gansbaai at the right time of year, you can watch a parade. I was in Gansbaai in December and was lucky enough to participate in a parade, which was great fun. I played the drums in the parade and also on stage, along with people who worked and volunteered for Marine Dynamics, Dyer Island Cruises and APSS. The other performances included songs and dances, and my favourite was the Christmas carols sung by the local choir. Afterwards the mayor gave a short speech and gave the countdown to turning on the Christmas lights. They were beautiful and you could feel the Christmas ambience. If you want to try these activities, consider choosing Marine Dynamics, Dyer Island Cruises and APSS. Your choice makes a difference because the money you pay these organisations will fund research programmes and conservation projects and help to support the penguins and other seabirds at APSS. All of these organisations form part of the Dyer Island Conservation Trust. Gansbaai is a beautiful area and I would definitely recommend that you visit it.